Oh wow! This is like a get-together of all my favorite people and their "projects" - my new friend Martina's Catalogue63, my college buddy Angela's Vestito and my old friend (as in we've known each other over half our lives) Ivy's Urban Ashram! 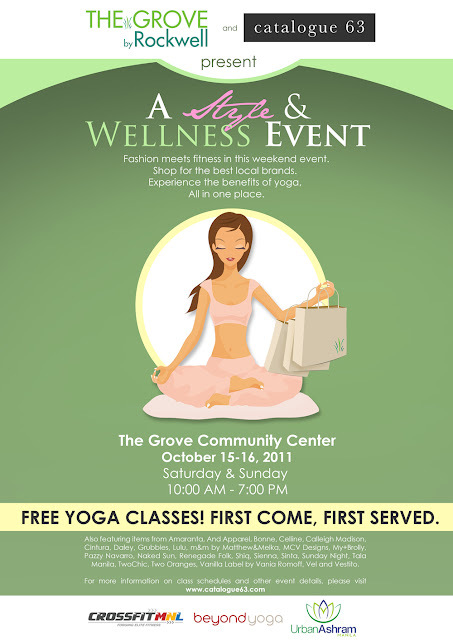 The Grove by Rockwell and online retailer Catalogue 63 is inviting you and your family and friends to “A Style and Wellness Event” on Saturday and Sunday, October 15 and 16, 2011 from 10:00 am to 7:00 pm at The Grove Community Center on C5, Pasig City. The event will highlight the launch of Grubbies on Catalogue 63 and introduce other new brands available - Bonne, Lulu, Pazzy Navarro, Vestito, and m&m by Matthew & Melka. The weekend event will also feature free yoga classes by popular fitness centers and studios Beyond Yoga, Crossfit Manila, and Urban Ashram. “We believe that inner wellbeing goes hand in hand with outer appearance. Simply put, if you don’t feel good, you won’t look good. The launch of Grubbies, the perfect post-workout wear, on Catalogue 63 gives us the perfect opportunity to advocate health and wellbeing through this exciting event”, said Martina Gomez, marketing manager of Catalogue 63. Here's what I have to say, "Be there or be square! "If you see Martina, Angela and Ivy there, tell them I said hello! Yey! Thanks Abu! Miss you!!! !